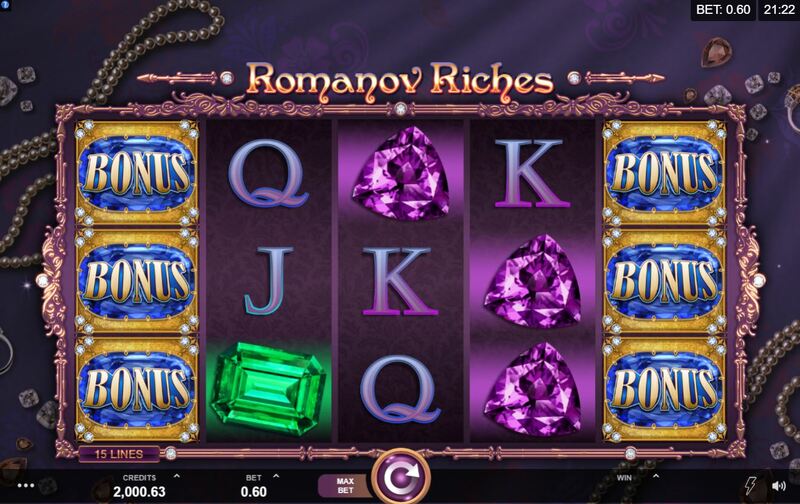 Romanov Riches slot bears the name of the famous last Tsar of Russia and although you won't see any Faberge Eggs here there is no shortage of other jewels so loved by these rulers. This is another slot designed by one of Microgaming's in-house developers, this time Fortune Factory. The reels lie over a display of jewellery on purple satin to give an atmosphere like that of The Finer Reels of Life and indeed we have the similar soft background music to boot. What isn't similar are the reels which are more like those of Play'n Go's Jewel Box as is the game in general. So will our bankroll avail itself of any of these riches or like the Romanov's back in 1917 end up down the bottom of a well, shot to pieces? There are 5 reels of 3 rows each and 15 paying lines which we pay 20-coins to spin. Icons are all stacked including the scatters and Wilds, the Wilds being our best pay at 50x bet for 5-of-a-kind. After that there are Emeralds or Sapphires awarding 4x, Amethysts or Rubies at 25 coins and the five card values paying either 15 or 5 coins for a full line. 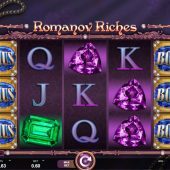 You get Mystery Stacks which all turn into one particular icon on each spin and there is a respin feature which occurs when at least the first two consecutive reels from the left have the same icon. The remaining reels respin and if the third reel matches afterwards another respin occurs until no more full reels are added. This is pretty much a method of providing a full-screen of what are usually lower card values with dreadfully low pays - a full screen of Jacks say awards a staggering 3.75x stake! If you get at least 3 reels full of bonus scatters from the left you are awarded what must be one of the worst ever slot features. For reels 1, 2 and 3 full you get a spin of the bonus wheel for a paltry cash prize. If you fill the first 4 reels you get two paltry cash awards and a full screen of bonus scatters will then apply a multiplier to the two paltry cash awards to make a slightly less paltry cash ward. Awesome.